Deep blasts of massed conch shells send pulses through the blackness of the hot June night and push by us as if they are spirits searching out the living to join them. Despite the humidity a chill passes down my spine. We heard the conches being blown the previous day but, at 2am, they sound very different. They are summoning the villagers of Aorigi to battle bad spirits and disease by chasing demons off their island during a ceremony known as Puta Wagona, the Beating of the Ground. The biggest conch is known as Afuri and it sounds first. Afuri had been brought from its resting place the previous afternoon and washed - with the other conches - in the sea. This symbolised the capture of the malign sea spirit. Afuri was then restored to his resting place to await his star role. At some time after midnight - when the Moon, Sun and Morning Star are in a certain position - Wogasia begins with a silent raid to capture Afuri. Villagers say the sea spirit within the conch must be surprised and hence the need to silently approach it during the darkest part of a moonless night, with no torches or light. Tradition says that if the spirit is woken he will flee the shell and the island will suffer famine and pestilence. The 1.30am raid succeeds and the captured shell now leads the calls for action. More pulses from the conches force their way through the air. They are not single sounds but multiple short, yet somehow languid, blasts. They are in laid-back Solomons tempo – pahu, pahu, paaaah, pahu, pahu, paaaah, pahu, pahu, paaaah - and are combined with shouts of encouragement. Puta Wagona is a major part of the annual Wogasia Spear Festival on the remote island of Santa Catalina in the Solomon Islands. The traditions of Wogasia - which means worship - focus on cleansing and renewal for the villagers of Aorigi. It is a spiritual rebirth that sees locals cleanse the island of bad spirits, rid themselves of hostility towards anyone who has slighted them, and starting the new planting season afresh. Once an important festival throughout the whole Makira region, the villagers on Santa Catalina are the only Solomon Islanders to have kept the tradition alive. Elsewhere, even just across the water on Santa Ana, Western churches effectively closed it down mid last century. Its remoteness has help Santa Catalina maintain Wogasia. The island is an hour-and-a-half flight south of the capital Honiara, followed by a 30-minute jungle trek to a fishing village and then a 20-minute longboat trip to its white sands. Visitors to Wogasia are few - we are but a dozen or so travellers to the festival - but we don’t remain outsiders for long. On the beach, we are welcomed by the high chief and adopted into the village. This is no act for tourists, it is a serious and solemn moment that means I now have family on Santa Catalina. This even entitles me to land on the island. Back in the 2am dark shouts count down - the Beating of the Ground is about to begin. We are told to move into the central part of the village to wait for the runners to pass by. Be careful and stay back, we are advised, you don’t want to be covered in what they throw at the runners. We do as we are bid and listen as the excitement builds … then it is on. To uninitiated eyes the Beating of the Ground is a strange mix of New Year’s Eve, Guy Fawke’s night, the Running of the Bulls and a tribal riot. Everywhere there is shouting; thumps as the solid central cores of palm fronds hit the ground and then huge bursts of sparks as those same clubs hit burning coconut husks sending clouds of red sparks into the air. Screams echo and re-echo, followed by yells of annoyance as the runners are covered in all sorts of unpleasant-smelling liquids thrown from the huts. The villagers have taken much of the day preparing pots of fish-head water, yam peelings and other smelly stuff. Dave, an Australian living in Honiara, is hit by some liquid and continues on no doubt wondering how long it will take to remove the odour. It is about 20 minutes of chaotic fun. Men, women and children are all involved, laughing, yelling, whooping in the darkness. More thumps, more screams, more excited laughter. Then it stops. The villagers have beaten their spiritual adversaries and it is time to walk to the beach and throw the frond clubs into the sea. This banishes sickness and disease as they do so and prepares the way for a good future crop. The night is now calm again and still quite sticky. I need water but, for the next 15 hours or so, that liquid is banned. It is part of the cleansing process of a new beginning and so we instead have fresh coconut water to drink. For three hours we sit on the beach and wait for sunrise. Many locals eat betelnut – the favoured mild intoxicant of the Solomon Islands - or lie down and sleep. Others talk and watch the sky eventually lighten in the east. It is a pretty view across the channel to Santa Ana island, but now my focus is on the next highlight of the day – the first spear fight between the men of the island’s two tribes - the Amuea and Ataga. Although Wogasia is much more than throwing spears at someone who has annoyed them over the past year, this is what people really want to see. The sunrise fight of Faiarifa Wogasia is between teens, uninitiated men and some warriors who are just getting their aim straight for the big clash in the afternoon. 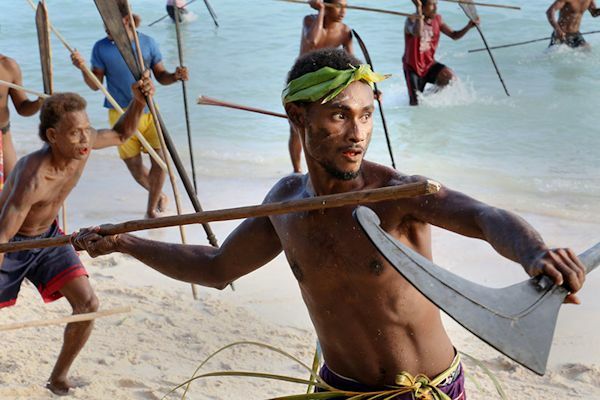 The fighters – some dressed in the traditional costume of long palm pal frond crown and skirt - stand about a cricket pitch apart in two straight lines out into the water. When the action starts it is full on. Anyone who thinks this is a game, or a bit of fun, has not stood in the frontline and watched as blunted wooden spears fly between the two groups. The power of the throwing is awesome and the accuracy spot on. One warrior to my left is hit once. A spear lands at my feet. Then the warrior is hit again. The blows clearly hurt him and he holds his right shoulder for some time. Despite this being the “junior” event it is very willing and lasts about 10 minutes. Small axe-shaped shields are skillfully used to deflect the spears and when several warriors look as if they are about to get stuck in with their fists the chiefs call it a day. One walks out into the middle of the warring factions with his spear raised high. Eventually the fighting stops. No one dares to ignore his commands. As soon as it is over it is as if the opposing tribes have just finished a sports contest. While they didn’t file by saying “good game, good game, good game” they greet each other and then all walk along the beach together towards the centre of the village. The warrior who was hit several times greets the man who bested him. They smile and talk. They are cousins. It is now time for the women to walk up the hill to Faraina, where they will have an intricate banana-leaf suit woven around them. The light-green costume will cover them from head to ankle. Warriors who will take part in the main spearfight also head up the mountain to cover themselves in mud. Many men have been banned from this year’s duel as they are in mourning for family members who have died since the last festival. In mid-afternoon the peace of the hot day is shattered when out from the jungle break scores of armed warriors and boys carrying out a mock raid on Aorigi. It is a noisy affair as the mud-covered horde runs between the outlying huts and pushes its way down to the beach. The chanting and yelling grow louder as the adrenalin of expectation for the main spearfight courses through their bodies. Some locals climb trees to get a better look at the action which, when it kicks off, is a no-holds-barred event. You can hear the grunt as the fighters cast their spears, the loud knocks as they are deflected, or the mutter of pain when they strike home. One deflected shot flicks off into the crowd and hits a guest in the chest. We later discover there may be something to the belief that wounds done during the spear throwing heal quickly and without medicine as there was not a mark on his body. Almost as quickly as it starts the spear fight is stopped. The intensity is such that within five minutes the chiefs end the contest. With the fighting over and peace restored a score or so women, adorned in their banana-leaf costumes, go into the ocean and are handed the conches. They sound them for a final time and release the spirit to the sea. The conches then are stored for next year’s Wogasia. That night the village gathers in groups to feast, listen to bamboo band music and watch dancers. They are all looking forward to a new year filled with plentiful food from both ocean and field. As one of the very few “former outsiders” to take part in the festival, it has been an honour to join in Wogasia. The next time I return I will, as part of a tribe, be able to take to the sands of battle on Santa Catalina.